Cafe Blossom East: Vegan Oasis in NYC. Photos. 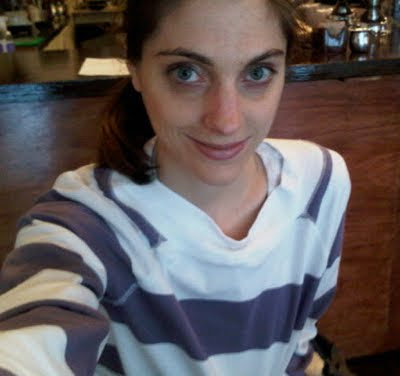 This past Sunday, I dined on a late lunch at Cafe Blossom East, upper east side NYC. I have been a huge fan of Blossom Restaurant downtown for a few years now, so when I suddenly found myself at 1st/79th with a growling tummy and a famished look in my eyes, I did the standard "looking at the outdoor menu" thing for 2 seconds, then yanked my husband inside to dine on heavenly vegan eats. I left with a glimmer in my eye and hop in my step. But was it a green juice or chocolate ganache glow? Hmm. Check out my feast review and photos from Cafe Blossom..
Subways uptown, downtown, walking from Mott street to Sullivan street, past a bazillion Starbucks, past fashionistas in SoHo, my tired flip-flop wearing feet slipping on the cobblestone of Mercer street, through Greenwich Village, Astor, stop for a soy chai, onto Union Square, metro uptown, the 6, whoops wrong side of the platform, crossover, upper east side and back again. Not to mention hiking six flights up and down and up and down stairs to check out a one bedroom apartment that most sane people would call an "oversized shoebox". NYC: Many Oasis's. East Village? I breeze into Liquiteria for a Papaya Paradise with spirulina smoothie. Gramercy/Union Square? One Lucky Duck juice and a mallomar. West Village? GoBo juice bar. UWS? Josie's juice bar it is. LES? Cruise up to Caravan of Dreams, sigh sadly at Teany, or pop down to Babycakes. SoHo? My favorite Le Pain Quotidien on Grand street or maybe some seasonal sorbet at MarieBelle. UES? Candle Cafe or GoBo. And now I can head to my new fave: Cafe Blossom. And I have many more hot spots, but this is a post about Cafe Blossom.. More of my restaurant picks in my FAQs here. Tired. Weary. Food. Now? Please. Yes! You know the feeling: you are famished, exhausted and just about spent. Taxi to bed please! My husband and I had been walking NYC city streets for five straight hours. My feet were numb. My legs were on autopilot. My brow was narrowed into an angry glossed-over stare. A tired pout on my lips. The honks, shouts, laughter and cries of NYC seemed to blur together into a restless hum. My senses were dulled beyond belief. I took careful caution when crossing the street because, lets face it, I really couldn't dart out of the way of an oncoming cab, hurried bus or delivery biker right now. I smelled a corner pretzel vendor and thought: yum, smells like heaven. Oh no, I must be famished! We considered simply getting back on the metro or hailing a cab back to a nice cozy bed or couch asap, but then my mind flickered. We were somehow on the UES. A place we rarely journey to, to be honest. (Except for a special bite at Candle 79 or H and H bagel run). 80th and 1st, the street signs said. Well Cafe Blossom is just a street away! I googled on my Blackberry. The Cafe was surprisingly empty. A few scattered tables of quiet diners. I guess 4:30 on a Sunday isn't prime dining time for UES folks. We took a table by the window. Behind the bar. A late afternoon sunbeam reflected off the clear glasses and shiny wooden tables. The calm atmosphere was perfect for my buzzing mind. Two Juices: Field of Greens and Forest. 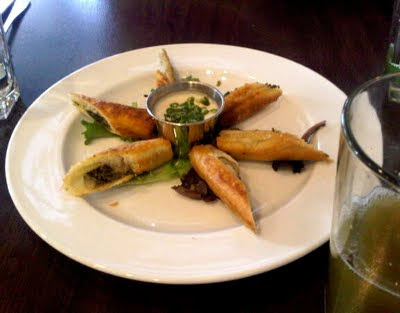 Appetizers: Mushroom Flutes with Cashew Cream Dipping Sauce. Dessert: Chocolate Ganache to split. Juices were delicious. Both green. Hub's forest juice had a nice kick from the ginger. My green juice was dark and hydrating. I chugged it. The Mushroom Flutes were steamy hot and o-m-g amazing. Savory mushroom filling wrapped in crispy vegan filo dough flute. Warm. Crisp. Cashew cream dipping sauce. I kept remarking how they somehow tasted like a buttery grilled cheese sandwich from my childhood. I asked my husband if it would be weird to chug the last of the cashew cream sauce. He said no. But I restrained myself and instead dipped the garnish lettuce greens into the sauce and sucked them dry. Amazingly perfect appetizer. 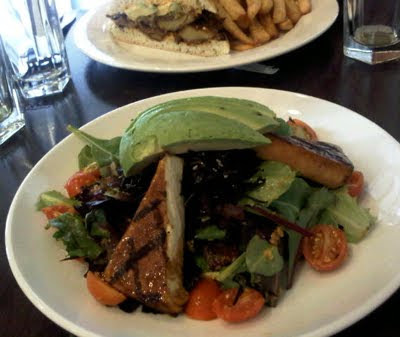 Grilled Tofu Salad (pic at top) with added avocado was just what my tummy was craving. My tofu was perfectly grilled. Firm, nice charred grill flavor. Greens were fresh and hydrating. Carrot dressing was light and flavorful. Avocado was perfectly fresh. 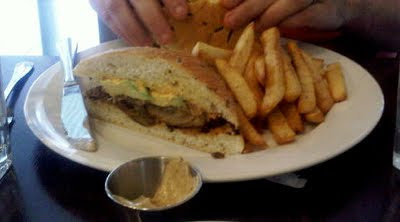 My husband's southern seitan sandwich was awesome. I took a few bites of seitan. Spicy, crispy, yummier and healthier than any 'meat sandwich' you will ever eat. My husband, who FYI for newbies, is not vegetarian, love, love, loved it. Fries were tasty too. Lightly spiced. He asked for dijon mustard on the side. The waitress found some for him. Dessert was pretty amazing. I actually wanted to order the lemon cheesecake or the blueberry apple fruit cobbler - but my husband loves chocolate desserts so I gave in. Glad I did. Moist, rich (yet light and fluffy) and dark chocolate truffles on the side. 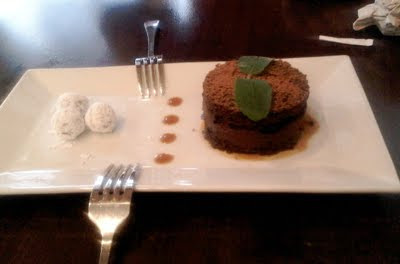 This dessert was the perfect cap to a perfect meal. The end result: I was revived. My mind was working properly again. I actually glowed a bit. I said it was the green juice. My husband insisted it was the chocolate ganache. Cafe Blossom East is worth a trip to the UES - even if you are a downtown girl like me. Cafe Blossom East - go go go. Hours: Monday thru Friday from 11am to 9:45pm, Saturdays from 11am to 10:00pm and Sundays from 11am to 9:15pm.